/p. 14: Valois Burgundy came into being through a series of historical accidents and through the agency of far-reaching socio-economic and poltical forces; but partly it was created by the will of men intent on establishing for themselves and their descendants a place in the sun, a power, a lordship; intent, too, on doing what they conceived to their duty to God and to the people He was was supposed to have appointed them to rule over. These elements in the emergence of Valois Burgundy will be apparent in what follows. Some contemporary observers noted with astonishment that a fourteen-year-old boy stood by the king of France John the Good (who was actually among the worst of medieval French kings) on the battlefield of Poitiers even though he was too young effectively to carry arms. He was the king's youngest son, Philip Valois; his elder brothers had been withdrawn out of harm's way. This battle, fought on 19 September 1356, was arguably the most decisive and significant defeat suffered by the French at the hands of the English in the entire Hundred Years War. John the Good and his son Philip were both taken to England as prisoners-of-war and remained there until the French had accepted the humiliating peace settlement of Brétigny in 1360 and promised to pay an enormous ransom for their release. While France suffered, Philip's heroic behavior at Poitiers had brought him important advantages: the nickname Bold was probably given him at this time, and his grateful father granted him the duchy of Touraine. But a greater opportunity for his youngest son's advancement soon presented itself to John the Good. Philip of Rouvres, the last Capetian duke of Burgundy, died on 21 November 1361, and the vacant duchy fell to the French crown. 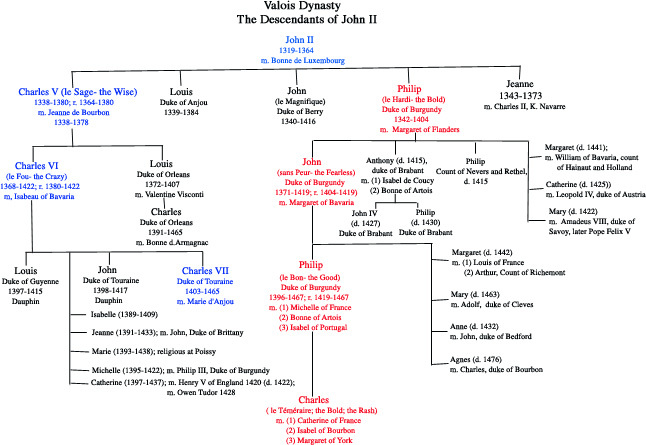 King John lost little time in arranging for Philip the Bold to exchange Touraine for the much larger and more important duchy of Burgundy, and Philip was confirmed /p. 15: as duke of Burgundy when his brother Charles V succeeded his father John II as king of France in 1364. Through much of European history marriage has been a ruler's most fruitful means of political advancement. When Philip of Rouvres died he was only seventeen, and a promising political and dynastic future had seemed ahead of him through his marriage to Margaret of Flanders, who was the only child and heiress of the count of Flanders Louis of Male. Not unnaturally, the hand of this dynastically desirable young lady, aged eleven when widowed in 1361, was sought in marriage by Philip of Rouvres' successor in the duchy, and eventually, in 1369, it was successfully obtained, against English competition. Thus, from 1369, Philip was, through his wife, in line of succession as the next count of Flanders after Louis of Male. Moreover, Philip had secretly promised his father-in-law that he and his successors as counts of Flanders would retain the important French towns and territories of Lille, Douai, and Orchies which King Charles V had ceded to Louis of Male to induce him to agree to this daughter's marriage to Philip the Bold. This was in spite of the fct that he had also promised his brothewr King Charles that he would hand them back to the crown of France on his father-in-law's death. 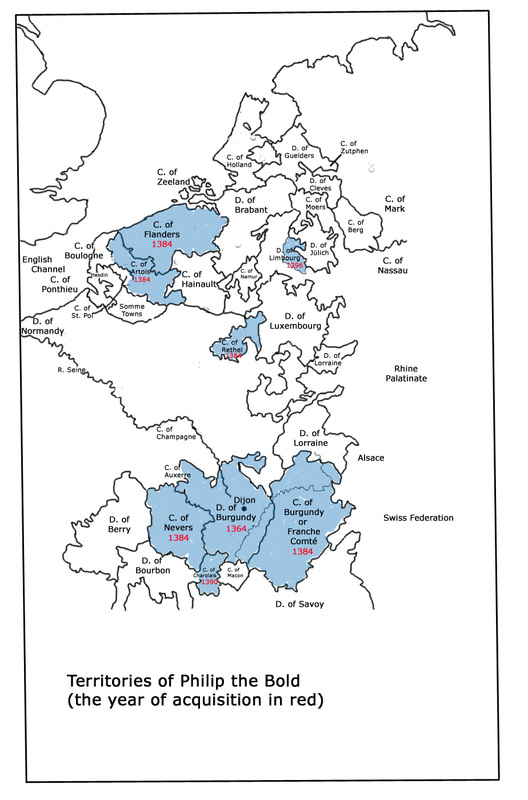 Besides becoming prospective ruler of a Flanders enlarged by these territories, which lay next to it and which naturally he never did hand back to France, Philip the Bold also became in 1369, again through his wife, prospective count of Artois and Burgundy, territories then ruled by Louis's mother Margaret of Artois, and prospective count of Rethel and Nevers, not to mention prospective ruler of the towns of Malines and Antwerp and the baronry of Donzy. Such were the scintillating perspectives of dynastic aggrandizement secured by Philip the Bold in 1369 at the age of twenty-seven. But he was perhaps not too confident about these attractive possibilities for, though Philip's mother-in-law Maragaret of Brabant was forty-six, his father-in-law was only thirty-nine at the time of his nineteen-year-old daughter's marriage. Philip's succession to all these rich and extensive lands was not quite assured. For ten years, from 1369-1379, Duke Philip of Burgundy bided his time, devoting himself, as a loyal French prince, to helping his brother King Charles V fight and negotiate with the English, but not forgetting at least an annual visit to Flanders. Then, in the first days of September 1379, the weavers and other artisans /p. 16: of Ghent rose in arms, assassinated the count's bailiff, burnt down his castle of Wondelgem on the outskirts of the town, and led and organized the revolt of a large section of the Flemish populace against his authority and against the ruling classes of Flanders. In these critical circumstances Louis of Male appealed for help to the king of France and to his son-in-law Philip, who promptly sent a detachment of Burgundian soldiers to fight the Flemish rebels. In 1382 he went much further and brought a French army into Flanders with the new king of France, his nephew Charles VI, at its head. Although on 27 November 1382 the Flemish were decisively beaten by this army on the field of Roosebeke, Ghent continued the revolt on her own and, in 1383, obtained important military assistance from England. The war dragged on until the end of 1385, but Louis of Male had died on 30 January 1384, two years after his mother Margaret of Artois. From that date on Philip the Bold was the proud ruler of five counties, Flanders, Burgundy, Artois, Rethel, and Nevers besides his duchy of Burgundy. Philip the Bold's first task as ruler of these territories was the pacification of Flanders, and this was eventually achieved on 18 December 1385, when rebellious Ghent accepted the peace settlement of Tournai. It was in 1385, too, that Philip created the nucleus of a genuine central government for his scattered lands by appointing the Frenchman Jean Canard as "chancellor of my lord the duke of Burgundy" with the function of presiding over his entire administration. The chanceries of Burgundy and Flanders were allowed to lapse. Soon afterwards, in 1386-7, Philip the Bold undertook a thorough overhaul of the administrative machinery of his various lands which virtually amounted to the establishment of a new, unified administration. One or two treasurers and a signle receiver-general of all finances were to control the whole of the financial administration. Then, in ordinances of February and July 1386, the duke reorganized his regional administrations in the two main groups of territories so that henceforth a single combined council and accounting office at Dijon was responsible for the government of the southern territories, while a similar institution at Lille was responsible for Flanders, Artois, Rethel and the other northern lands. It could perhaps be said without exaggeration that single new polity, a Burgundian state, was created in this way by Philip the Bold out of the amalgam of territories he and his wife had brought together as a result of their marriage. /p. 17: It was a fortunate historical accident for Philip the Bold, which he successfully exploited, that at just the time of the genesis of this new polity the established powers in the West were being crippled by internal crises and ineffective monarchs. In England the heroic days of continental conquest under Edward III and the Black Prince gave way, in 1377, to the feebler, uncertain rule of the youthful Richard II, which was severely shaken in 1381 by the Peasants' Revolt. In the Holy Roman Empire, the reign of the bibulous Wenzel or Wenceslas, who was deposed by some of the imperial electors in 1400, began in 1378 amid scenes of turmoil and civil strife. More favorable still for the rise of Burgundian power were contemporary circumstances in France. Here, in 1380, Philip the Bold's statemanlike elder brother Charles V gave place to his nephew Charles VI, who had scarcely come of age when, in 1392, he went mad. From the very moment of Louis of Male's death at the beginning of 1384, Philip the Bold showed by his actions that the power-base he envisaged for himself and his family extended far beyond the boundaries of the lands he had so far acquired. His father-in-law had staked a claim to the duchy of Brabant through his wife Margaret of Brabant, and in March 1384, before he had even taken formal possession of his newly inherited county of Flanders, Philip the Bold was in Brussels, the capital of Brabant, haggling with that duchy's ruler his aunt Joan of Brabant, who was childless and likely to remain so, being then over sixty. It took Philip six years to persuade and bully Joan into secretly making the duchy over to him and his wife Margaret and their heirs, but Joan still retained possession of it for the rest of her life. This arrangement was made in September 1390 but already, three years before, Philip had harassed Joan into ceding to him rights in some isolated territories beyond the River Meuse and outside the boundaries of Brabant, the most important of which was the duchy of Limbourg, finally ceded to Philip in full ownership in 1396. 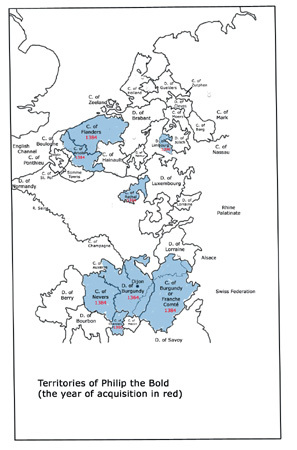 As to the duchy of Brabant, the succession could by no means merely be settled by a private arrangement between princes, for the Estates of Brabant had a right to be consulted. 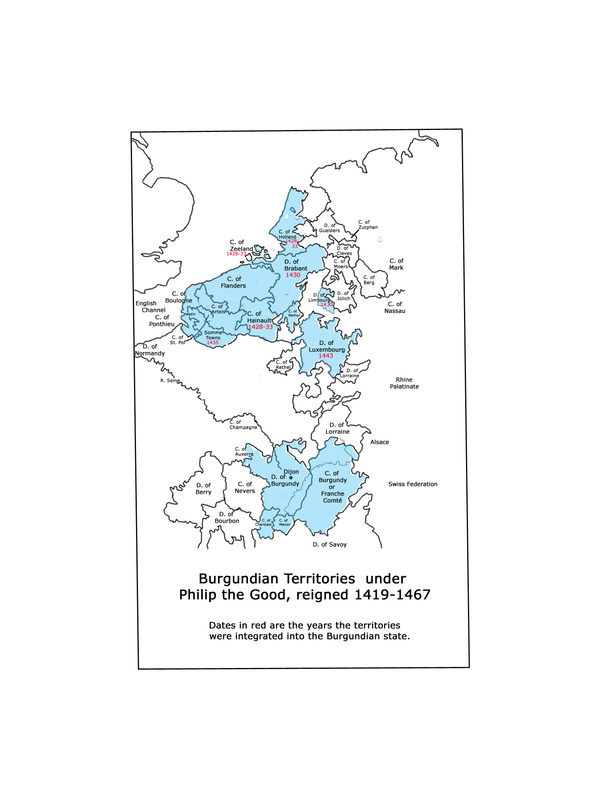 In this instance they refused to permit Brabant to be incorporated into Philip th Bold's new Burgundian state. Instead he was only able to obtain their agreement, given eventually in 1401, that the aged Joan --she died in December 1406 when over eighty-- would be succeeded as ruler of their duchy by Duke Philip's younger son /p. 18: Anthony. Morover, as a price for this agreement, Philip had to promise to return Limbourg, which he had acquired in 1396, and Antwerp, which his father-in-law had annexed to Flanders in 1357, to Brabant. 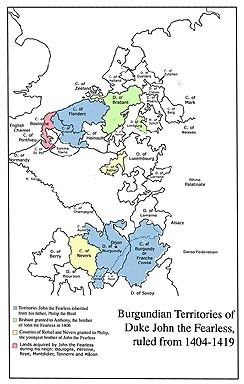 Of Philip the Bold's other territorial acquisitions, the only one of any importance was the county of Carolais, a territory bordering on the duchy of Burgundy which Philip bought from one of his vassals in 1390. This addition to the southern group of territories was somewhat comparable in importance to the purchase of the county of Namur by Philip the Good in 1421, which bordered on Brabant and formed a useful addition to the northern territories. Philip the Bold's various schemes for the succession of his children to his territories show that he never envisaged the separation of the northern and southern lands, for in every one of his suggested settlements the eldest son John was to inherit both Flanders and the duchy of Burgundy. Nor, after Philip the Bold's death in 1404, did the partitioning of his territories between his sons seriously undermine their essential unity. John the Fearless became ruler of the duchy and county of Burgundy, with Charolais, as well as of Flanders and Artois in the north; Anthony became duke of Brabant in 1406; and Philip was given the relatively small and insignificant counties of Nevers and Rethel. Although he did not in his short ducal reign (1404-19) acquire much reputation as an empire-builder, John the Fearless was careful to maintain the Burgundian state in being, and indeed by acquiring French territories of Boulogne, Péronne, Roye and Montdidier in the north and Tonnerre and Mâcon in the south he virtually made up for the loss of Rethel and Nevers to a junior branch of his dynasty. The son and successor of John the Fearless, Philip the Good (1419-67), added so many territories to the Burgundian state that he has often been regarded as its founder. However, the way towards the acquisition of these lands had in every single case been prepared by his grandfather. In 1385 Philip the Bold had arranged a marriage alliance between his own children and those of Albert of Bavaria, ruler of Hainault and Holland, which established a Burgundian claim to those more or less united counties. He had laboured for years to obtain the duchy of Brabant and at last succeeded in bringing it into the Burgundian orbit. And in 1401 he had obtained control for a time of the duchy of Luxembourg. These were the lands which his grandson /p. 20:added to the Burgundian state: Holland and Hainault, with Zeeland, in 1428-43; Brabant, with Limbourg, in 1430; Luxembourg in 1443. Thus Philip the Good only had to complete, in 1425-43, the structure half-built by his grandfather in 1363-87. When William of Bavaria died in 1417 he left an only child, the sixteen-year-old Jacqueline of Bavaria, to succeed him in his lands of Hainault, Holland and Zeeland. At once she and her territories became the centre of attention of neighbouring dynasts. 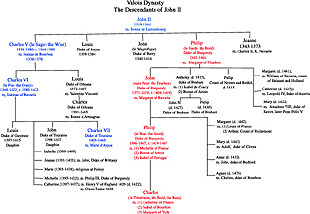 The duke of Burgundy, John the Fearless, succeeded in arranging her marriage to his nephew John who had succeeded John the Fearless's brother Anthony as duke of Brabant when Anthony was killed at the battle of Agincourt in 1415. The wedding took place at Easter 1418 and it seemed likely that Brabant might now be united with Hainault, Holland and Zeeland under a junior branch of the ducal family of Burgundy. However, by 1420 another prince, the brother of the deceased ruler of Holland, Jacqueline's father William of Bavaria, had succeeded in wresting from her and her husband a good part of the counties of Holland and Zeeland. This was John of Bavaria, who had resigned his bishopric of Liege in order to pursue these territorial ambitions in Holland at the expense of his nearly defenceless niece Jacqueline. A complex situation thus confronted Philip the Good when he became duke of Burgundy in 1419, and it soon became more complex. On 11 April 1420 Jacqueline ran away from her husband, who appears to have subjected her to a petty domestic tyranny; in 1411 she fled to England; and in 1422 she married Duke Humphrey of Gloucester, one of the several sons of King Henry IV who formed a council of regency after Henry V's death in 1422 on behalf of that king's child son Henry VI. No doubts apparently troubled her and Duke Humphrey's consciences as to the validity or propriety of this marriage. While the pope at Rome, Martin V, dithered and appointed a commission of cardinals to investigate and decide on the validity of her first marriage to Duke John IV of Brabant, Jacqueline applied to Martin's rival, Benedict XIII, who continued to regard himself as the one and only true successor of St Peter even though he had been exiled to the rocky retreat of Peñiscola on the coast of Aragon, and even though he had been abandoned by the whole of Christendom. This obstinate old man was happy to do what his rival Martin had refused to do, and the wedding of Duke Humphrey and Jacqueline thus received the seal of his approval. / p.21:Humphrey of Gloucester was an ambitious and aggressive adventurer. Optimistically styling himself count of Hainault, Holland and Zeeland, in the autumn of 1424 he crossed to Calais with his wife Jacqueline and marched into Hainault with a contingent of English troops. They were opposed there by Philip the Good, who challenged Duke Humphrey to a single combat and even went into training for it in the grounds of his castle at Hesdin in Artois. In the event, Jacqueline fell into his hands, but in September 1425 she escaped from his custody at Ghent disguised as a man and once more fled to England. The struggle for the succession of Hainault, Holland and Zeeland continued, for Jacqueline obtained further help from England, from substantial elements of the Dutch populace, and from the neighbouring bishop of Utrecht. Her uncle, John of Bavaria, had died in January 1425, leaving the field clearer for Burgundian inter vention. This had been persistent since 1417; it was now greatly intensified. Nonetheless, though he enjoyed support there, especially in the towns, Philip the Good had to conquer Holland by force of arms, and four large-scale campaigns between 1425 and 1428 were necessary to achieve this. In the end Jacqueline was forced to submit and make over her lands and all her claims to them to the duke of Burgundy, who finally took them over in 1433. Jacqueline had been abandoned by Duke Humphrey, who married his mistress Eleanor Cobham soon after Pope Martin V, in January 1428, had pronounced that his marriage to Jacqueline was invalid. She died in 1436. The acquisition of the duchy of Brabant by the Valois house of Burgundy was a much more straightforward affair. The younger branch of the family, which Philip the Bold had contrived to install in Brabant, came to an end in August 1430 on the un expected death of Philip of St Pol, younger brother and successor of Duke John IV, who had ended a brief, totally ineffective and more or less disastrous reign as duke of Brabant by dying in 1427. Philip the Good had already taken the precaution of persuading Philip of St Pol to recognize him as his heir if he died without children; he now entered into negotiations with the Estates of Brabant and triumphed over his rival claimants to the duchy by persuading the Estates to accept him. On 8 October 1430 he made his 'joyous entry' into the city which he was to transform into the capital of the Burgundian state. The last substantial territory which was incorporated on a permanent basis into the Burgundian state by Philip the Good /p.22: was the duchy of Luxembourg. Before he had become its temporary ruler in 1401, Philip the Bold had made numerous other interventions in this duchy. His successor John the Fearless pursued a similar policy and, mainly as a result of his efforts, his younger brother Duke Anthony of Brabant was effective ruler of Luxembourg between 1409 and his death at Agincourt in 1415. Naturally Philip the Good continued these Burgundian initiatives towards Luxembourg. This time the role of unfortunate heiress, victim of Burgundian aggrandizement-the role which had been played by Joan of Brabant and by Jacqueline of Bavaria was taken over by Elizabeth of Görlitz, a granddaughter of the Emperor Charles IV. By 1440 this duchess of Luxembourg was an elderly widow, encumbered with debts. Everyone of any account with even the remotest claims had their eyes on her extensive and strategically important territories, but it was to her nephew Philip the Good that she eventually made them over, in 1441. Once again, Burgundian military power had to be called on, and the town and duchy of Luxembourg were conquered from one of the other claimants, Duke William of Saxony, in autumn 1443, after that ruler had rejected another of Philip the Good's flamboyant challenges to single combat. From 1443 on the duchy of Luxembourg formed part of the Burgundian state, though several other European princes besides the duke of Burgundy regarded themselves as its rightful duke. The Burgundian state, then, was put together between 1363, when Philip the Bold became duke of Burgundy, and 1443, when his grandson became ruler of Luxembourg. 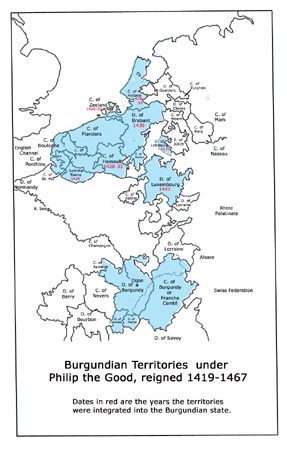 Subsequent additions of territory can only be regarded as temporary or superficial; in any event they were made too late to contribute to the emergence of the Burgundian state. The so-called Somme towns -- a slab of territory on the River Somme which included Amiens, Abbeville and the county of Ponthieu - came nearest of these additional lands to being genuinely incorporated into the Burgundian state. Charles VII mortgaged them to Philip the Good in 1435, but his successor Louis Xl redeemed the mortgage in 1463 and restored them to France. Admittedly, Charles the Bold forced Louis XI to return the Somme towns to Burgundy in 1463, but subsequent history showed that the crown of France would never be content until it had regained possession of them. As to Charles the Bold, his territorial acquisitions were short lived, and the only one that might be considered an addition to the Burgundian state was the duchy of Guelders. / p.23: Administratively, this was indeed integrated fully into the rest of Burgundy, but it was only acquired in 1473 and then only at the cost of imprisoning the lawful ruler Adolf of Egmond. Further south, Lorraine was conquered by Charles the Bold, but in 1475 only, and he held it for scarcely a year; and the rights and lands acquired in mortgage by Duke Charles in 1469 in Upper Alsace were forcefully taken from him by the inhabitants five years later. 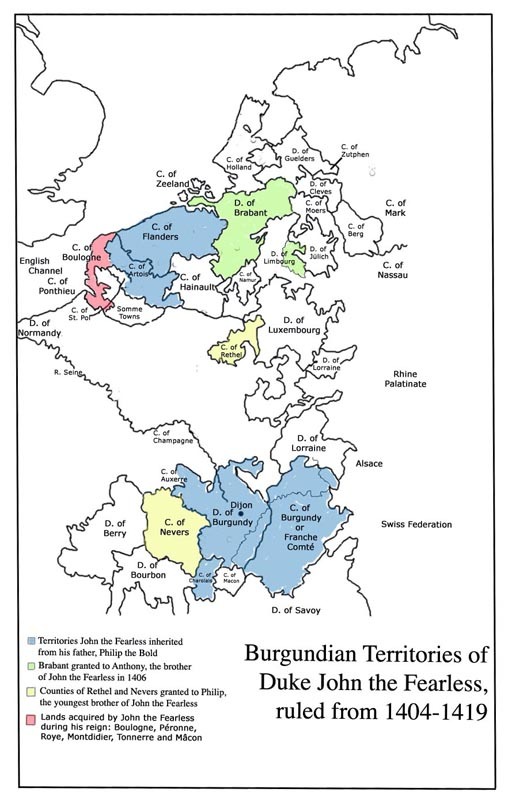 It seems unwise, therefore, to regard any of these territories as belonging effectively to the Burgundian state. It is not easy for us now to picture Valois Burgundy in the mind's eye or relate it on the map to the other European powers of the fifteenth century. From Holland in the extreme north to the south of Franche-Comté in the neighbourhood of the Lake of Geneva is about 500 miles. At its widest point on this north south axis, in the Low Countries, Valois Burgundy extended some 250 miles from the Somme to the Zuiderzee (now the Ijsselmeer). In the south, the two Burgundies were about 125 miles long from north to south and some 155 miles across from west to east. But the north-south axis, even after Charles the Bold's conquest of Lorraine in 1475, was incomplete. There was still a thirty-mile gap between the northern and southern group of territories. For thirty years before that, since Philip the Good's conquest of Luxembourg in 1443, the gap was 125 miles wide, and during the first half of the history of Valois Burgundy, from 1384 to 1443, it extended for some 185 miles as the crow flies, between southern Artois and the northern frontier of the duchy of Burgundy. Two map features meandered north-south more or less through the centre of Valois Burgundy along its north south axis - the frontier between France and the Empire, and the Rivers Meuse and Saone. In area, Valois Burgundy was comparable in size to the kingdom of England (with Wales), or Portugal, or Aragon, or Naples (with Sicily and Sardinia); but it was not as large as Castile or France. If size, wealth, population and natural resources be taken together it was a lesser power than France but greater than Savoy or any of the German or north Italian states. The scatter of its territories must have caused administrative delay: it took anything from one to four days to deliver a letter within either group of territories, and a week to communicate between Brussels and Dijon (250 miles apart as the crow flies). But this scatter also conferred on Valois Burgundy a remarkable variety of resources. In the south, besides wine and salt, were /p. 24: boundless deciduous forests, parts of which still survive affording abundant supplies of timber and game. In the northern territories, where the rolling chalklands of Artois contrasted with the lush water-meadows of Flanders and Holland and the afforested hills of Luxembourg, was the greates centre of urban development in medieval Europe: Antwerp, Amsterdam, Ghent, Bruges were all inside the frontiers of Valois Burgundy.